In many ways, WWII was just WWI - 2nd Edition. So, it seems only fitting that games based on WWII would also have second editions. In this case, it's Quartermaster General WW2. Ares Games and Griggling Games are coming together to bring you an updated version of this advanced tactical game. Griggling Games will be launching Destination: Neptune, their new sci-fi board game, at Origins this weekend. 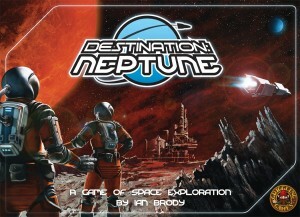 Destination: Neptune, a science-based space exploration board game will be released at the Origins Game Fair 2014 on June 11, 2014 by Griggling Games, Inc. It is a deep strategic game in which players must manage resources and plan carefully in order to have the most Victory Points at the end of the game.